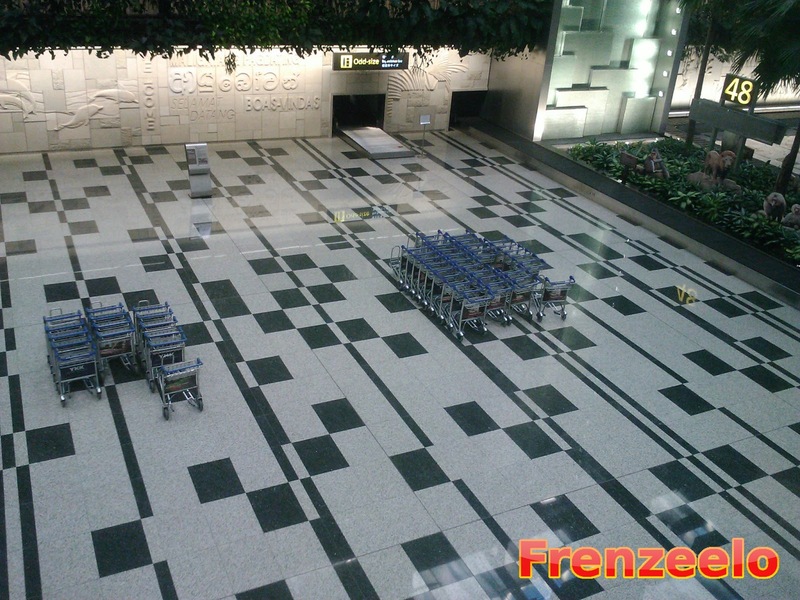 Normally when you visit an airport, what do you see? Airplanes and busy people talking on their phones while carrying briefcases? 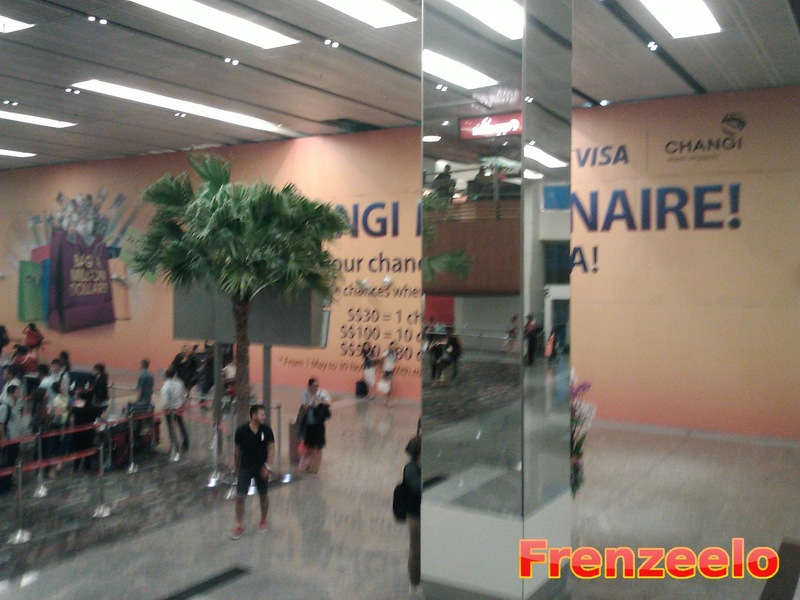 Yes but Changi Airport is more than that. 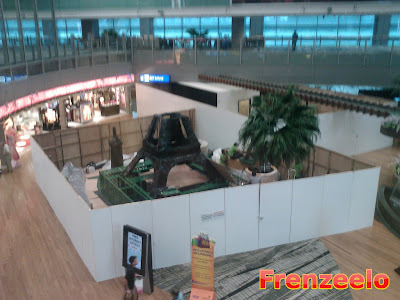 Changi Airport has something for everyone whether they're passengers or not. With beautiful architecture, constant upgrades, clean toilets and good service, it's no wonder Changi Airport is one of the best airports in the world. Since I came here as a non-passenger, I cannot get in the Transit area of the airport. 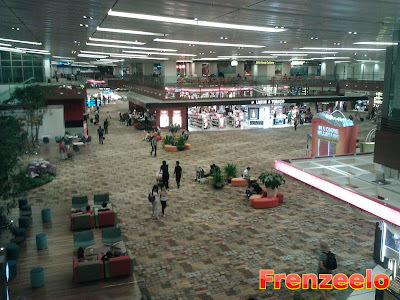 Nonetheless, Changi Airport is still a great place for those who wants to sho` (there's no GST even for non-passengers), explore and eat. I particularly like the latest terminal which is T3 or Terminal 3 for short. The architecture and layout here is totally different than the first two terminals. 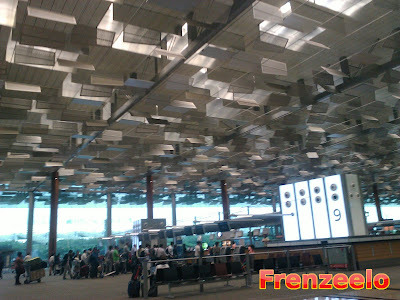 For example, in Terminal 3, if you check out the ceiling, it's unique and allows natural sunlight to enter. Thus, saving electricity along the way. The lifts here are also transparent and unique. Although, I cannot enter the Transit area, there were windows and transparent partitions that separate the Transit and Public areas. So, I took some photos of the Transit area. Above, as you can see, there is an Eiffel Tower still under construction. Well, it's just a replica for an event about the Seven Wonders of the World. The Transit Area and the Public Area is equally as magnificent. 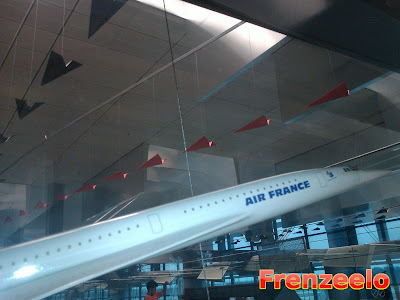 Oh and since it's an airport, one of the first things to do is to check out the Viewing Gallery. 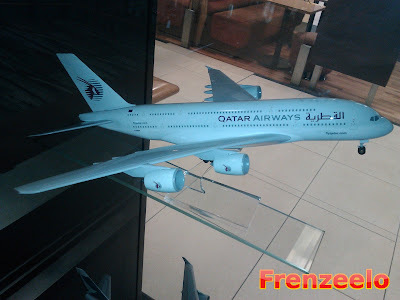 I didn't really like the Viewing Gallery as the gallery is far away from the airplane parking area and you can barely see the planes thanks to awfully designed windows. And see the floor? That's the Transit Area. 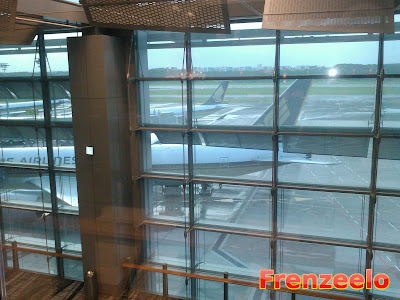 However, Changi Airport's first terminal, Terminal 1, has a better Viewing Gallery. The Gallery offers panoramic views of the airplane parking area and the gallery is nearer unlike the one at Terminal 3. 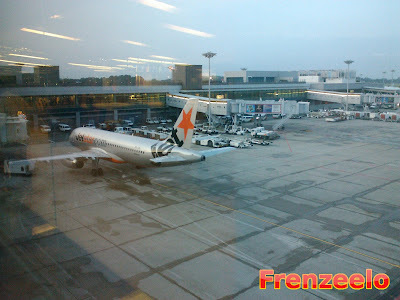 It seems that this portion of the parking area is for Jetstar Asia airplanes. One of the first budget carriers. 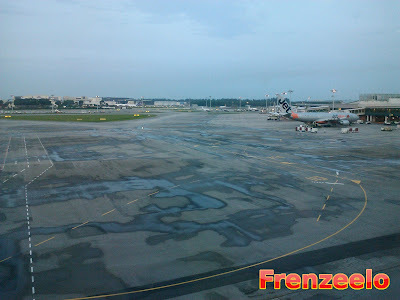 And, I was lucky enough to take a video of a Jetstar airplane coming in and finding a parking area here. Not so sure if it was carrying passengers or not and there was a small vehicle pulling the airplane. 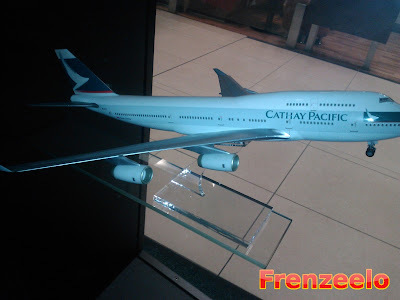 I also took a video of a Cathay Pacific airplane passing by the terminal. Sorry I'm not posting the videos. 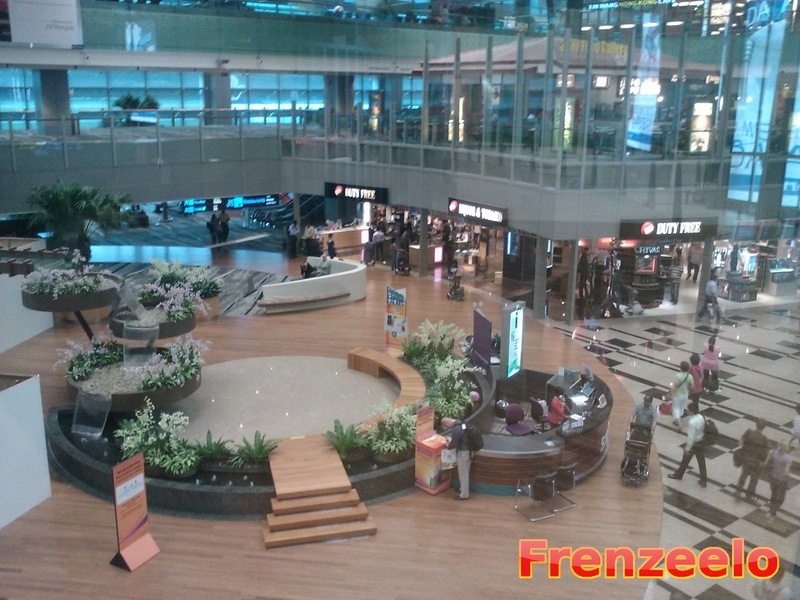 All three terminals at Changi Airport offer a wide range of shops and eating establishments. 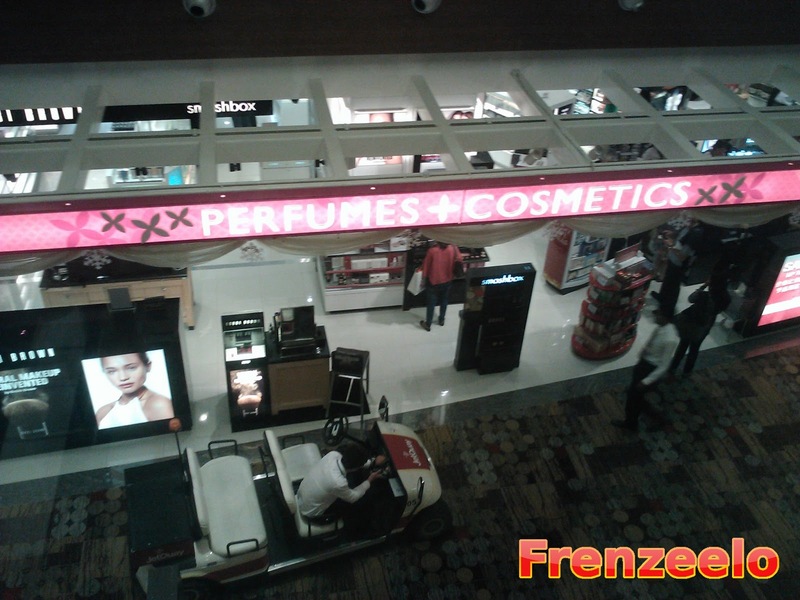 Whether they're clothing stores, fast food outlets, snack stalls, there's something for everyone. Plus, no GST (Goods and Services Tax) is charged so you'll save a small amount of money as compared to other places in Singapore. The shops at the public area are as good as the shops in the transit area. 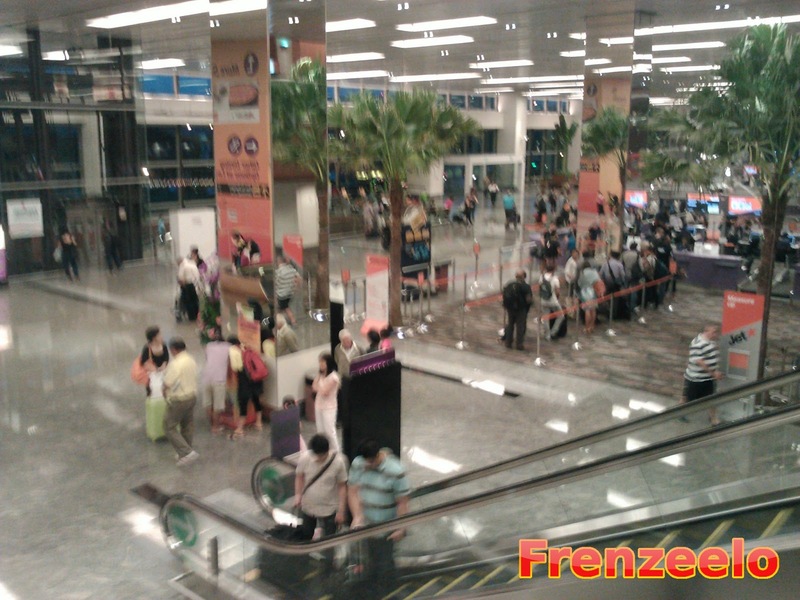 The transit area also offers a wide variety of free facilities for passengers waiting for their flights. 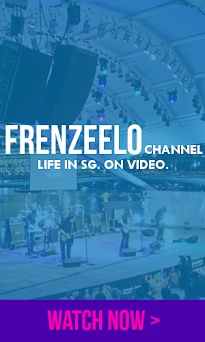 Free internet areas, free movie screenings, prayer rooms, kids play area and more. I wish all these are available to non-passengers. 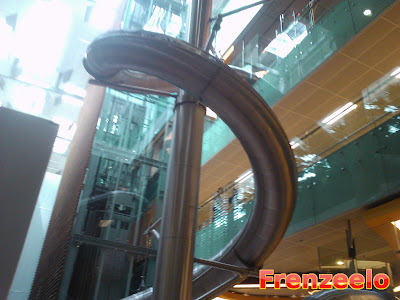 However there is one free facility at Changi Airport which is available to the non-passengers, Singapore's tallest slide. Look at that. Such awesomeness. Slide@T3 is open to the public and best of all, it's free! No matter how old you are, whether you're 7 or 77, anyone can ride on the slide. 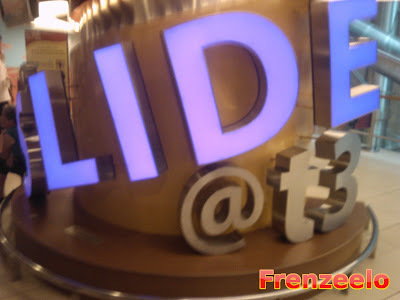 There are 2 slides. The free one and the paid one. The free one is just one and half floors long, whereas the paid one is over four floors long. 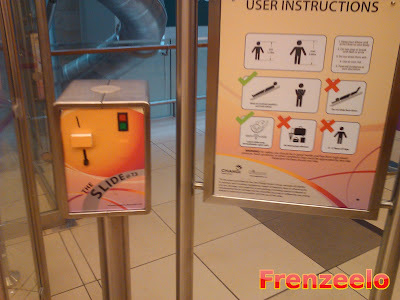 You have to spend a minimum of S$10 at any Changi Airport shops to be able to ride on the taller one. It's quite ridiculous that you have to pay that much for a slide that lasts just a few seconds but the free one, even though shorter, is just as scary and fun. Getting from one terminal to the other is easy. 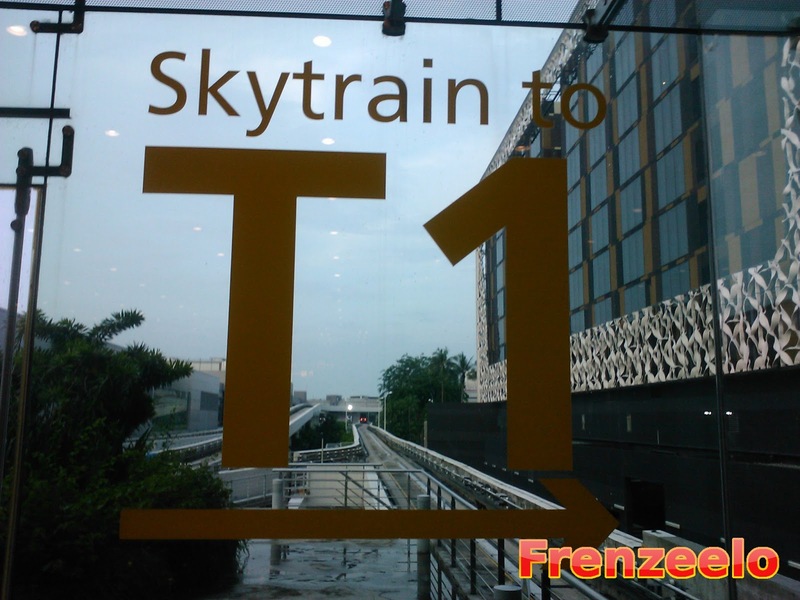 Just hop on the free Skytrain from any terminal to another terminal (except Budget Terminal. You have to take a shuttle bus). 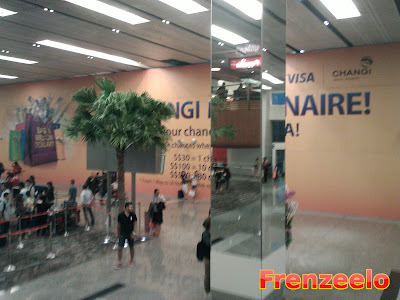 Getting to Changi Airport is also easy. There are plenty of buses and there is even an MRT Station which connects to the city area and neighbourhoods in Singapore. And if you are a foreigner who is heading to the city area, save some money and don't take the taxi or the airport limousine. Instead, board service 36 from the bus terminal at any Changi Airport terminal. Service 36 goes to the city area especially City Hall and Orchard. Or the East West MRT Line (Green Line) from Changi Airport to City Hall. 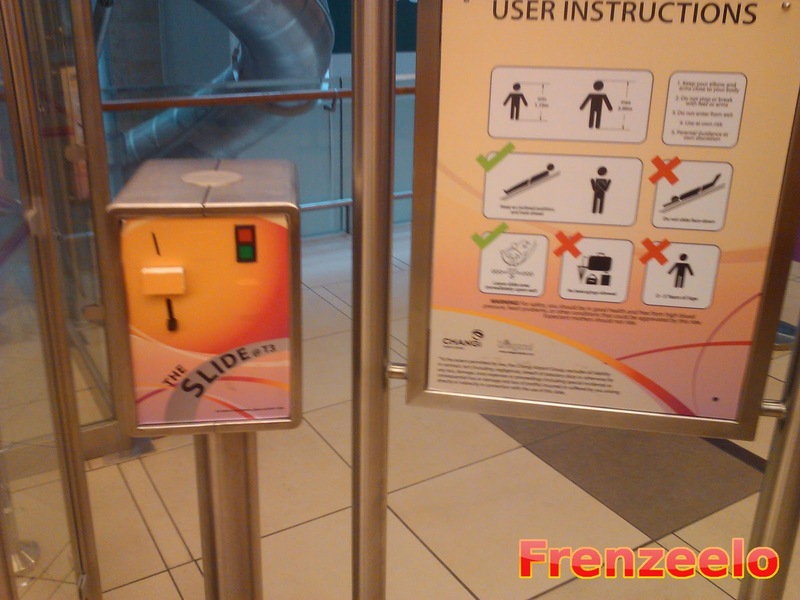 (Make a transfer at Tanah Merah MRT station). 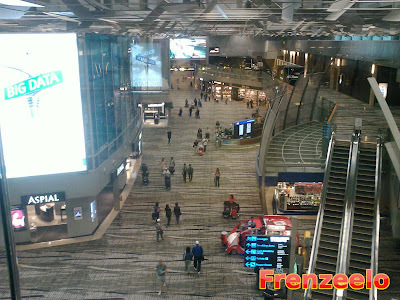 Changi Airport consists of four terminals. Terminal 1, which opened in 1 July 1981, was the firrst one. 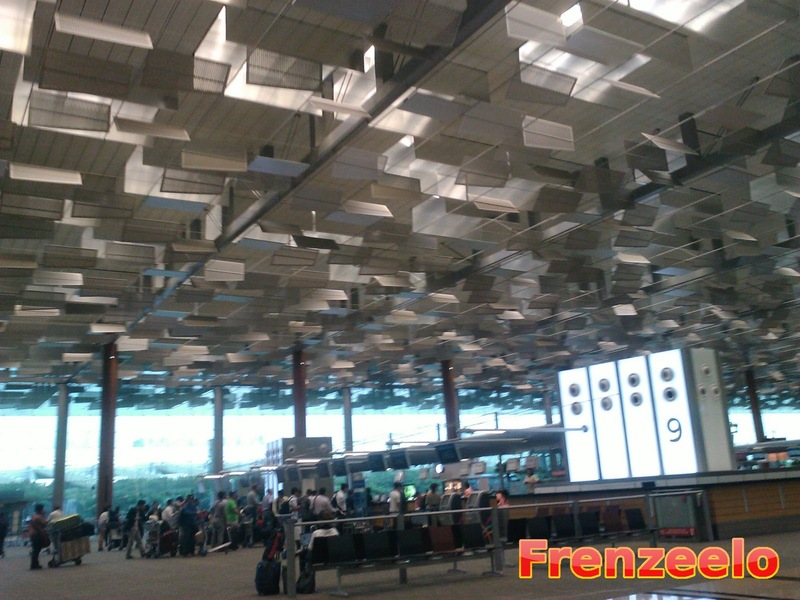 Then there's Terminal 2, which opened in 22 November 1990, the Budget Terminal which caters to budget flights opened in 2006, and the latest one, Terminal 3 opened in 2008. No matter if you're a passenger waiting for a flight, or if you just want to find a place to shop and relax, this is the place to go. It's family friendly, wheelchair accessible and luggage friendly.